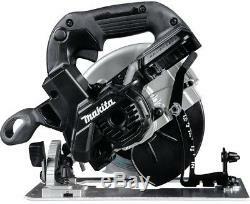 LXT Lithium-Ion Sub-Compact Brushless Cordless Circular Saw (Tool Only). Makita created a new class in cordless with 18-Volt LXT Sub-Compact tools. The XSH04ZB is engineered for cutting and ripping applications and is ideal for any contractor seeking a more compact cutting solution for framing, roofing, formwork and more. 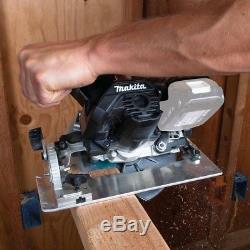 Circular Saw has a compact and ergonomic design at only 10-5/8 in. The compact size combined with the Makita-built brushless motor delivers up to 5,000 RPM and a superior power-to-weight ratio. The saw is equipped with Makita's Automatic Speed Change technology, which adjusts cutting speed and torque under load for optimum cutting performance. The efficient brushless motor is electronically controlled to provide up to 50% longer run time than non-brushless motors and in run-time testing the XSH04 made up to 350 cross cuts in 2x4 SPF lumber on a single charge of the 18-Volt LXT Compact 2.0Ah battery. Compact and ergonomic blade-right design at only 10-5/8 in. Weighs only 6.4 lbs. With 2.0Ah battery (battery not included) for operator comfort. 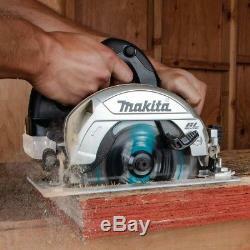 Powerful Makita built electronically controlled BL Motor delivers 5,000 RPM for faster cutting and ripping. BL brushless motor eliminates carbon brushes, enabling the BL motor to run cooler and more efficiently for longer life. 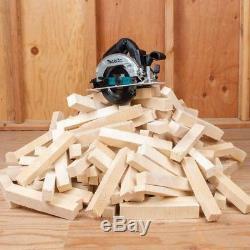 Large cutting capacity 2-1/4 in. At 90 and bevel capacity (0 to 50). LXT technology delivers up to 350 cross-cuts per charge in 2x4 SPF lumber using one 2.0Ah battery (battery not included). Automatic speed change technology adjusts cutting speed and torque during cut for optimum performance. Dual LED lights illuminate the work area. Electric brake for maximum productivity. 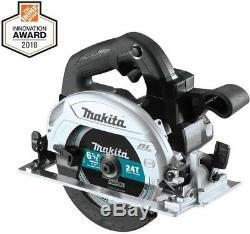 Includes a premium 55 tooth ultra-thin kerf carbide tipped saw blade (B-57071) ideal for cordless circular saws offering up to 66% more cuts per charge compared to our standard corded plunge saw blade (B-07353). Aluminum base and magnesium blade cover and motor housing provide a lightweight, durable design. Extreme Protection Technology (XPT) is engineered for improved dust and water resistance for operation in harsh conditions. 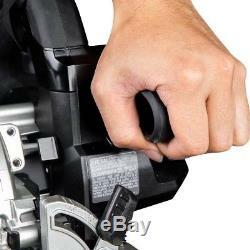 Rubberized soft grip handle provides increased comfort on the job. 3-stage LED gauge indicates battery charge level. On-board blade wrench for convenience. Built-in dust blower cleans the line of cut for operator accuracy. Flat motor housing design for stability when changing the blade. 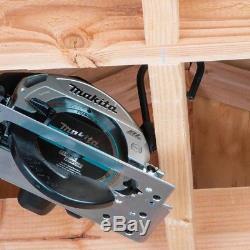 Ideal for framers, builders, roofers, forming and more. California residents see Prop 65 WARNINGS. 2-1/4 in Product Depth in. : 9.02 in Product Height in. : 8.43 in Product Width in. 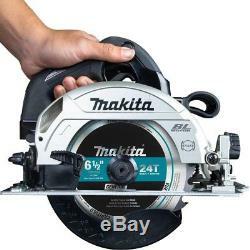 : 13.35 in Batteries Included: No Battery Amp Hours: No Battery Battery Power Type: Lithium Ion Battery Size: 18-volt Battery/Charger: Tool Only Bevel Capacity: 50 Blade Diameter in. 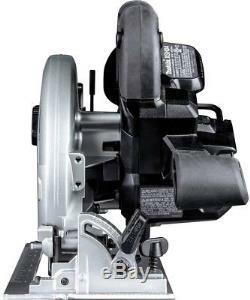 1-5/8 in Maximum Speed (rpm): 5000 Motor Type: Brushless Power Tool Features: Brushless, Depth Adjustment, Electric Brake Product Weight lb. 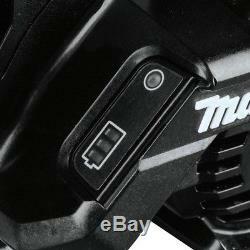 The item "Makita 18-Volt 6-1/2 in. LXT Lithium-Ion Sub-Compact Brushless Cordless Saw" is in sale since Sunday, November 25, 2018. 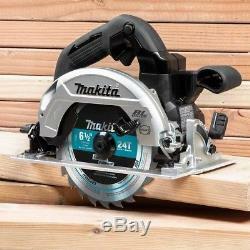 This item is in the category "Home & Garden\Tools & Workshop Equipment\Power Tools\Saws & Accessories\Circular Saws". 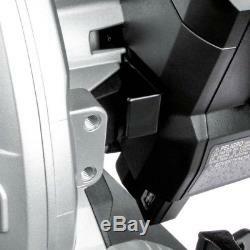 The seller is "blueanchor_deals" and is located in Continental .